OUR ASD EDITORS ARE EAGER TO RECEIVE YOUR MANUSCRIPT! The following guidelines will help you in having your submissions accepted by the editors for publication. The ASD is a non-profit, educational, and scientific Society open to all interested people. It is the goal of the editors to reflect this mix, but this doesn’t mean that your story has to be educational or scientific––just carefully and thoughtfully written. Oh, yes, and it must be about dowsing. ASD strives to assemble all manner of dowsing theories, ideas, techniques, applications, and personal experiences for study, evaluation, and just plain enjoyment. The American Dowser is a wide-open forum where the full range of dowsing thought may be freely presented for examination. We attempt to present a representative cross-section of this highly diverse and often contradictory material. Views of our authors are personal and bear no official stamp of approval or acceptance by ASD. Please note that, as an educational/scientific journal, we do not consider articles built around your client testimonials or those designed to promote your dowsing- or wellness-related business or modality to be appropriate for inclusion; but your dowsing-related experiences or insights gleaned from your work are always welcome! Please understand that submissions will be edited accordingly. 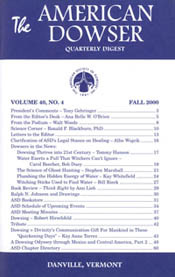 By submitting your work to The American Dowser, you are giving ASD the right to publish your article and any accompanying illustrations in The American Dowser; reprint same in any future edition of The American Dowser; and to post it on the members-only Digest section of the ASD website. While ASD has the right to use submitted articles in these three venues, the author retains all other rights to their own work. The ASD website section now archives every issue of the Digest in its entirety, and it cannot be responsible for how its contents are used beyond that medium. ASD also has reciprocal rights with other worldwide dowsing societies, so your article may potentially appear in their journals. The American Dowser accepts original work. Accordingly, we need permission to reprint your submission if it is original work which has previously appeared elsewhere in print in the exact format as submitted. In the case of interesting dowsing-related clippings or articles submitted from other publications or websites, it is your responsibility to procure (and include with your submission) a Permission to Reprint release from the publisher that gives The American Dowser permission to reprint it. Now for a few technical details. If you are unable to use email for your submission, please type it (preferably) or write it (definitely legibly). If using email, use Microsoft Word in 12-point Times New Roman. We would love any relevant photos, drawings, diagrams, and captions that enhance your story, as well as a photo of you, the author. All artwork should be in .jpg or .tif format and be at least 300 dpi (dots per inch). If sending by email, in the subject line include the word Submission and the title and author (i.e., Submission: Dowsing for Diamonds by Jacob Jones). Send your manuscript, photos, and art as email attachments to digest@dowsers.org, or by postal service to Editors, ASD, PO Box 24, Danville, VT 05828. Thank you for sharing your stories and ideas with us! 1. 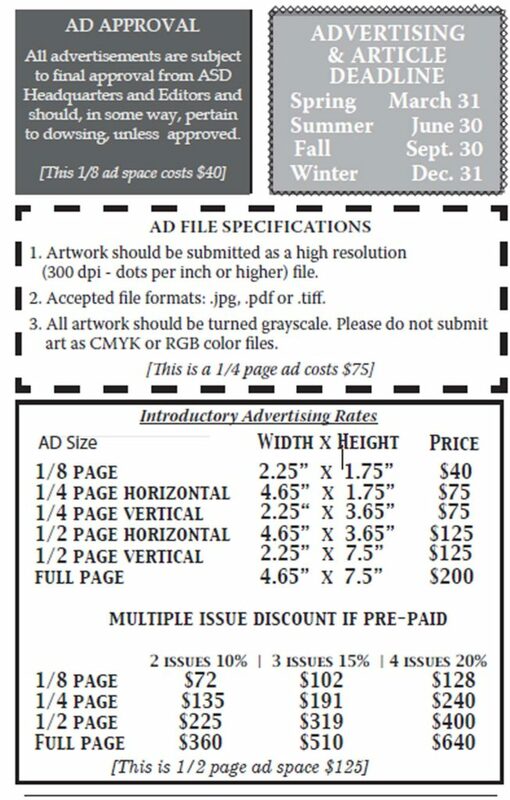 Artwork should be submitted as a high resolution (300 dpi - dots per inch or higher) file. 2. Accepted file formats: .jpg, .pdf or .tif. 3. All artwork should be turned to grayscale. Please do not submit art as CMYK or RGB files. Please use the drop down menu to tell us what size ad and how many issues you which to purchase.